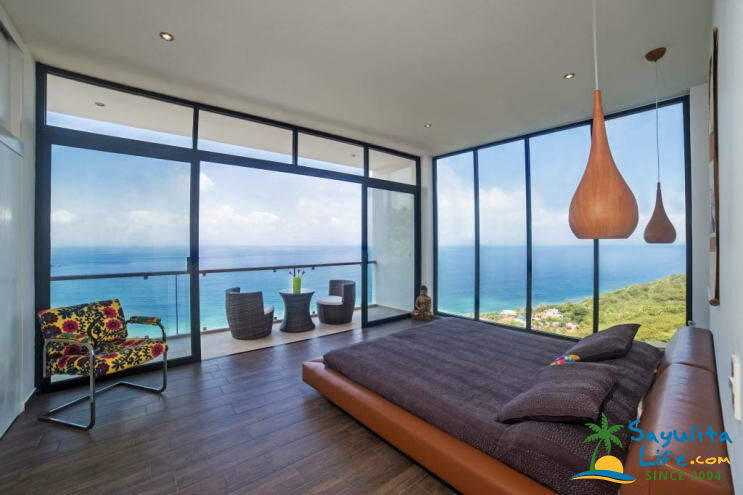 Villa Surya in Sayulita is a brand-new beautiful 6 bedroom luxury home with incredible panoramic views of the Sayulita bay, offering year-round sunsets over the Pacific Ocean. 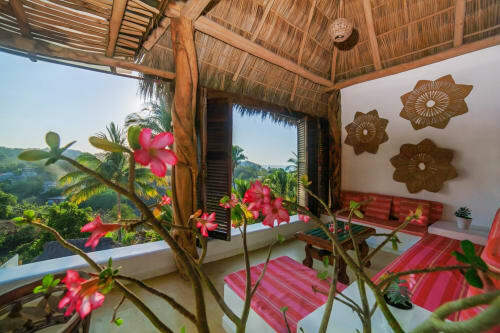 This Villa is located on top of the exclusive Nanzal Hill on the quiet north side of Sayulita. The villa consists of a main 2 bedroom home and 4 separate one-bedroom suites below. The main 2 bedroom home may be rented separately, or with 1-4 of the suites, creating 2-6 bedroom possibilities. Sometimes the one-bedroom suites are available to rent separately for $100usd/night, $125 during holidays. Seasonal rates vary, especially during various holidays. Please check the Pricing details tab for more information. The peaceful jungle setting, and the large, naturally-open feel inside, make property the perfect place to enjoy year-round sunsets and fresh ocean breeze. The main villa consists of a large 2 story home with 2 bedrooms, 2 1/2 baths, a large kitchen, living room, exterior dining area, and an infinity pool with incredible ocean views. There are balconies off of each bedroom, and a large terrace off of the main living area. Below the main house are 4 individual suites, each one with a queen-size bed and private bath. The two upper studios each have a private balcony, while the two lower studios each have a terrace with a private dipping pool. The studios can be rented individually, or together, with or without the main house. With several rental options, and an amazing view the house is ideal for travellers, small and large families or groups of friends. We have beds set up for up to 12 guests when the entire villa is rented. We allow up to 16 people, with an extra charge of $50/person for more than 12. We have two queen-size inflatable beds which can be set up in the main living area, or in any of the lower studio units. Incredible house and views. Just as beautiful as pictured. I'm glad you enjoyed your stay with us. Thanks for the feedback. We have decided to install blinds on the windows in the master bedroom. Also, I really hope you understand, it is very important for me to communicate well and respond quickly to my guests' needs. I'm really not sure how that happened, but all of your and your husband's emails were going to my junk mail at that time, so I had no idea you were trying to contact me about the golf carts. My apologies. Lovely house on top of Sayulita hills. Every room has a beautiful ocean view and view of the town. It was wonderful to watch the sunset every day from our balcony and see the moonlight at night. Tall windows in every room. I loved being outside of the very touristed area. The house was clean and well-tended and big enough for our group of 10. The rooms were nicely separated to give a feeling of space. The property manager was responsive to our needs. We accept payments with PayPal, Zelle, and direct deposit. 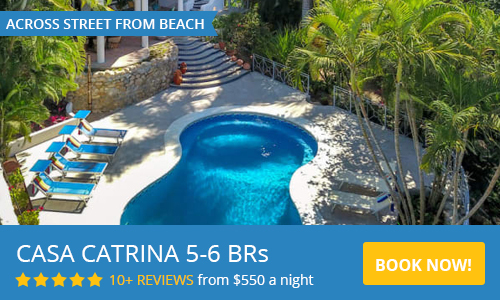 6 BEDROOMS (Entire Villa) rates for up to 12 guests. 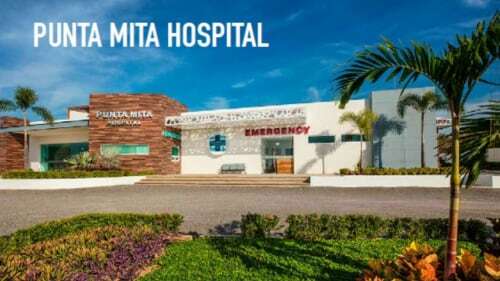 Maximum 16 guests, with an extra charge of $50 USD/night per guest. Pricing is for 2 people per bedroom, extra people are permitted for an additional fee of $50/night per person. Eric moved to Sayulita from Crested Butte, Colorado 10 years ago. He has had hundreds of happy guests come and go to 20 properties in town he manages. He is always happy to help you find the perfect accommodation.